Following an impressive win this past January, newly-crowned strawweight queen “The Panda” Xiong Jing Nan has emerged as one of the biggest martial arts superstars in the world. The 30-year-old Chinese martial arts prodigy had a fantastic performance as she dominated Singapore’s Tiffany “No Chill” Teo in the bout for the inaugural ONE Women’s Strawweight World Championship five months ago. Although the previously-unbeaten Teo showed tremendous heart and resilience, Xiong’s blistering offensive attack and striking superiority was simply too much for her to withstand. Xiong defeated Teo via technical knockout, stopping her Singaporean foe at the 2:17 mark of the fourth round to claim the gold-plated strap. 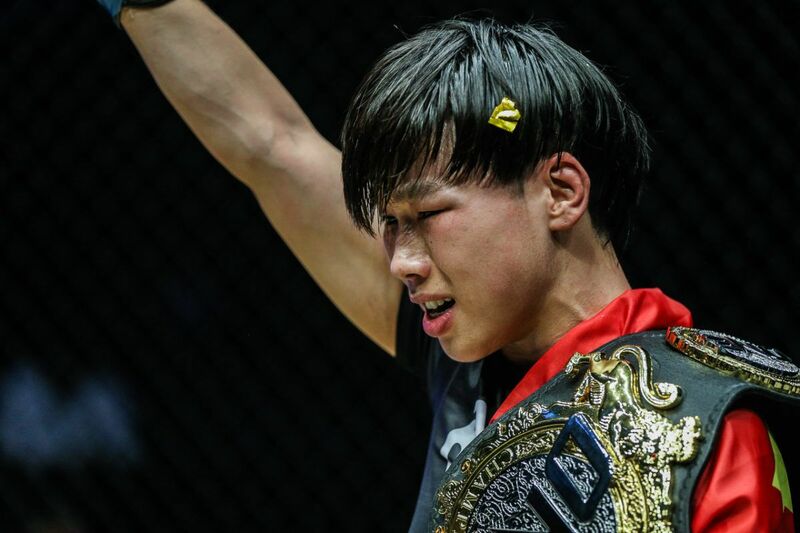 With the stirring victory over Teo, Xiong also became the first China-born world champion in the constantly-evolving sport of mixed martial arts. Despite her glowing repertoire as a global martial arts superstar, Xiong attributes much of her success to her father, who is not even involved with the sport. “My dad taught me a lot, including his life experiences growing up,” she shared. “From when I was a little girl, my dad told me never to run away when facing difficulties and to always take responsibility. Most importantly, he taught me to be brave and confident. Xiong credits her father for instilling strong moral values in her, like being brave, confident and disciplined. Moreover, Xiong is grateful that he taught her some of life’s most important lessons such as never running away from difficulties and always taking responsibility for her actions. “The biggest thing he gave me was courage. I really admired my dad’s courage and confidence,” she quipped. Xiong points to a childhood episode, where she climbed a neighbor’s house to pick fruit and broke her hand following a fall from the roof. Her father did not take her to the hospital at first, instead wanting to acknowledge her mistake and use it as a learning experience. “My dad did not take care of my injury at first. It was not that he did not care about me. He just wanted to let me know that this was my own mistake, and I needed to be responsible for the result,” she added. Xiong’s father eventually brought her to the hospital and had her hand nursed, which proved to play a pivotal role in her professional career. Xiong knows a big part of her success is because of her father and the values that he imparted to her at an early age. Even though he was most certainly tough on his daughter, there was a softer side to him that most people never had the opportunity to see. “He was really a person who was not good at expressing his emotions. In fact, he has different attitudes towards me for different things. When he should be gentle, he is gentle. When it is time to show a father’s love, he does it. His heart is actually really soft. I can feel his love for me from his heart,” Xiong stated. Inspired by her father’s valuable lessons, Xiong is ready to shine again as she will defend the ONE Women’s Strawweight World Championship against Laura “The Gladiadora” Balin. Both women are slated to face each other in the main event of ONE: PINNACLE OF POWER, which takes place at the Studio City Event Center in Macau, China on 23 June. Xiong emphasized that there is no one else to whom she will pre-dedicate her win in her upcoming bout against Balin but her father. “I am looking forward to the match. I do not know what is going to happen, or how the match is going to end, but it is going to be exciting. My pride cannot be moved. It only grows. I want to win this for my father,” she ended.